Welcome to Exterior Designs, Inc.
Congratulations. You have come to the right place. Exterior Designs, Inc. is a landscape planning and contracting company that services the Greater New Orleans area, including Metairie, Kenner, River Ridge, Destrehan, Luling, Mandeville, Covington, Houma and Thibodaux. In the fast-paced lifestyle of today, pleasant exterior spaces can serve as a haven for relaxation. Exterior Designs focuses on turning your unusable exterior into an outdoor living room that can be enjoyed throughout the year. Professionally designed landscapes not only add value to your home, but are also wonderfully therapeutic. 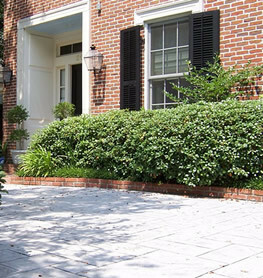 Exterior Designs was founded by Beverly Katz, Licensed Landscape Contractor and Horticulturist, as well as a Regional Board Member for the Association of Professional Landscape Designers. As a long-time resident of New Orleans, Beverly understands the climate of the South and incorporates this knowledge into her designs. When Beverly is not designing, she commits her time to enhancing her community by working with Parkway Partners of New Orleans and serving on their board. 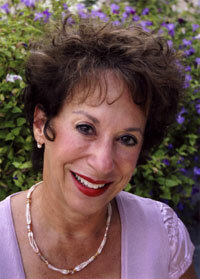 Beverly is also available for speaking engagements to educate the community about landscaping and offer her insight. Kay Ourso, Certified Landscape Architect, has over 20 years experience in the field and welcomes a challenge. Her education as well as her artistic flair makes her a wonderful attribute to Exterior Designs. A powerful team of architectural and engineering consultants joins Beverly and Kay. With their combined experience and expertise, Exterior Designs delivers the professional results you desire! 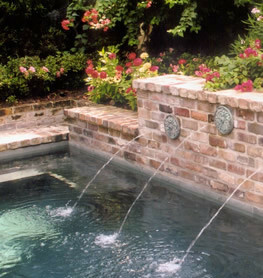 A lasting outdoor trend is the addition of a swimming pool, hot tub or water fountain. We specialize in designing around the focal point of your landscape, combining form with function to create an outdoor space as unique as you. We see a lot of problems in New Orleans where homeowners do not have their own parking or their existing driveway is broken. Our off-street parking service provides adequate space, while creating a beautiful level surface. 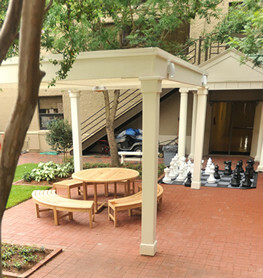 Courtyards transform even the smallest outdoor space into a relaxing haven. 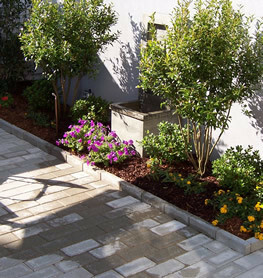 We are known for our traditional New Orleans style courtyards where we combine lush plants with hardscaping to complete any city garden. Many business owners are much too busy to focus on the office’s grounds. Our commercial landscaping service allows you to do what you do best, while giving you the peace of mind that your exterior will maintain a professional appearance. As an active member of many professional associations and organizations, Exterior Designs stays current with industry trends, design standards and permitting laws.